Singlets & Shorts. LJMDesign Provides Quality Printing, Signs and Websites. Cairns and Townsville North Queensland. LJMDesign will create a great looking design for your apparrel. 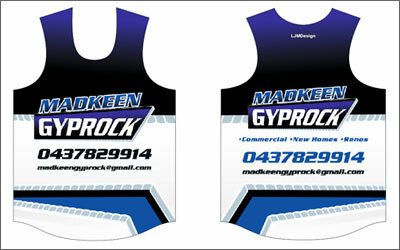 We supply 100% full sublimation printed singlets that keep you cool and looking good. Shorts that will complete your uniform and make you look like the professionals!